Cut the chicken into 10 pieces: breasts, wings, thighs and legs, cutting the breast pieces in half. 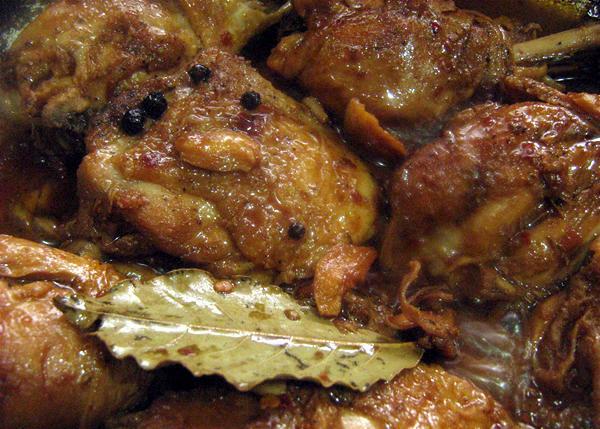 Place the chicken pieces into a large lidded Dutch oven or casserole. Add the garlic, vinegar, soy sauce, pepper and bay leaves. Bring the mixture to a boil over medium-high heat, then reduce to medium-low, cover and simmer until the chicken is thoroughly cooked (the meat will be firm, the juices will run clear, and a thermometer inserted will read 165 degrees), about 25 minutes. Turn the chicken halfway through for even cooking. Remove the cooked chicken pieces from the sauce and set aside on a plate. Continue to cook the sauce until it's reduced to about 1 cup, about 10 minutes. Strain the sauce, then add the chicken back to the sauce and toss to coat completely, before moving to a serving platter.